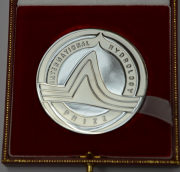 As of 2014, two medals will be awarded under the International Hydrology Prize: the Dooge medal and the Volker medal. Both medals are intended to distinguish outstanding achievements by hydrological scientists but with a different focus. The Dooge medal is aimed at fundamental contributions to the science of hydrology, whereas the Volker medal is aimed at outstanding applications of hydrological science for the benefit of society at large. The International Prizes in Hydrology shall be awarded to persons who have made outstanding contributions to hydrology such as confers on the candidate universal recognition of his or her international stature. The contribution should have an identifiable international dimension extending beyond both the country of normal work and the specific field of interest of the candidate. The medals may be awarded to hydrologists of long international standing or to younger but active hydrologists who exhibit qualities of international leadership in the science or practice of hydrology. - a list of the major scientific publications (max. 2 pages, A4 format). Nominations should be received by the Secretary General no later than 31 December of the previous year. The Dooge medal is particularly intended for hydrologists who have demonstrated scientific excellence, and have made fundamental contributions to the science of hydrology as evidenced by publications in the international scientific literature and other evidence of high standard. Preference should be given to candidates who have recently exhibited outstanding international leadership in the science of hydrology. The Volker medal is dedicated for hydrologists who have applied their research and hydrological expertise to the benefit of society, addressing issues of public interest and development. Applications of hydrology to the benefit of developing countries would count as an advantage. Preference should be given to candidates who have contributed through both scientific and practical work, and who have made outstanding contributions to the Hydrology community as demonstrated by active involvement in the work of IAHS or other international hydrological associations. History The General Assembly of IAHS held at Canberra in 1979 endorsed the principle of an International Hydrology Prize awarded annually from 1979 until 2013 on an individual basis in recognition of an outstanding contribution to the science. From 2014 two medals (Dooge and Volker) will be awarded. The Hydrology Division of UNESCO and the World Meteorological Organization contribute to the Prize and are represented on the nomination committee.